As spring blooms into summer, the city comes alive with the many colors of new plant life. But even though we live among and admire the foliage, our interactions with it retain an air of mystery. Do we seek to understand the plant world’s inner-workings, like nature photographer and Winnetka native John Ott (Secrets of Nature) or the alien scientists and their robot sidekick of Mission Third Planet: Green Grow the Plants? Can we take an active role in nurturing its growth, like filmmaker and gardener JoAnn Elam (Collards Garden 1985), or is there more to be learned from observing and allowing for the natural cycles of life (The Fall of Freddie the Leaf and Rebellion of the Flowers)? Mixing scientific examination with philosophical meditation, time-lapse photography with experimental animation, and educational with personal, diaristic filmmaking, this program seeks to unveil just a few of the many secrets of nature. Our Facebook event page is here & advance tickets will be available soon. Part of the “Nature’s Wonderland” series, this short film celebrates the work of Dr. John Ott, the “father of photobiology,” at work inside his greenhouse studio located behind his Winnetka home. Ott helped develop and popularize time-lapse photography and full spectrum lighting. His experiments with different colored lighting systems and their effects on the health of plants eventually led to experiments with colored lights on the health of animals and humans. Cinematic experiments from the home studio of Elgin resident and filmmaker, Julian Gromer (1907-1986), including microscopic crystal growth (AKA micrographs) and John Ott-inspired plant movement. These portions were originally spliced into an edited travelogue following young men on a bicycle trip cross-country (San Francisco to New York City). A pair of young extraterrestrial scientists, helped by charming robot Ten-ping, investigate and classify plant life on Earth while simultaneously fending off the villainous anti-science Cetillians. Written and directed by Chicago filmmaker Don Klugman. With bouncy music and bright animation from Don T. Schloat (also an animator for He-Man and Spider-Man, among other series), this film details the basics of asexual and sexual reproduction in plants and the names for the parts involved. Part one of a three-part series. Born in the spring, Freddie the leaf revels in the excitement of living in the cool breeze and summer sun, but as the season changes to fall and all the leaves start to change color, Freddie learns to accept his natural fate. A moving allegory for all cycles of life, based on the book by Leo Buscaglia. Part of a series of short films documenting her garden over several years, Chicago experimental filmmaker and master gardener JoAnn Elam stars in this film about growing collard greens. Her skill and love for the process is on full display as she carefully prepares the plot of land, plants each sprout, and finally harvests the fully-grown leaves for use indoors. In this animated story dedicated to “the Good People who resist the abuse of power in any form,” a gardener flaunts his control over the flowers in his garden, only to face the unexpected retaliation of his blossoming tenants. 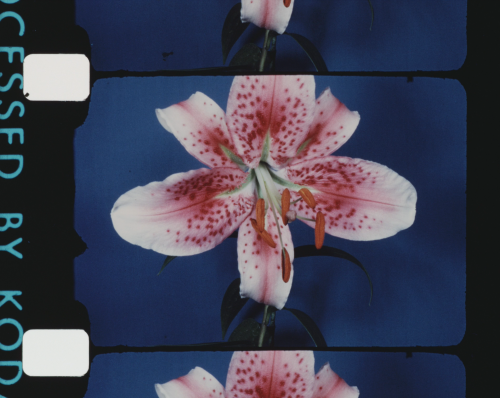 This rarely-screened 35mm short from Chicago mid-century designer Millie Goldsholl is presented in a new 2K scan created by CFA earlier this year for the Women Behind the Camera project.